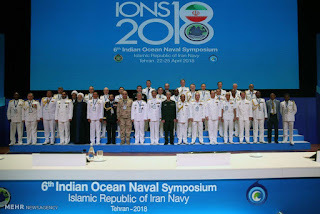 The 6th Indian Ocean Naval Symposium (IONS) has kicked off in Tehran with participation of 35 high-ranking military delegations from across the world. It is a two day event witnessing 35 high-ranking military delegations from across the world, including India, Turkey, and Australia. Iran will take over the presidency of the Indian Ocean Naval Symposium (IONS) for a two-year term. The previous rounds of the biennial event were held in India, the UAE, South Africa, Australia and Bangladesh. The IONS initiative aims to increase maritime cooperation among navies of the littoral states of the Indian Ocean Region. The Chief of the Indian Naval Staff, Admiral Sunil Lanba is leading a four member Indian delegation for the event. His visit is aimed at consolidating bilateral naval relations between India and Iran and to explore new avenues for naval cooperation. Admiral Sunil Lanba will also hold bilateral discussions with the Commander IRI Navy, and other participating ‘Chiefs of Navy/ Head of Maritime Agencies’. As the founder nation, India will also be conducting commemorative activities in November 2018 at Kochi, for celebrating the 10th anniversary of the IONS. The IONS was conceived by the Indian Navy in 2008. The Indian Ocean Naval Symposium, commonly known as IONS, are a series of biennial meetings among the littoral states of the Indian Ocean region. It provides a forum to increase maritime security cooperation, providing a forum for discussion of regional maritime issues and promote friendly relationships among the member nations. The inaugural edition of IONS was held in February 2008 at New Delhi, with Indian Navy as the Chair for two years. The IONS Charter of Business was agreed upon by the Conclave of Chiefs and brought into effect in February 2014.